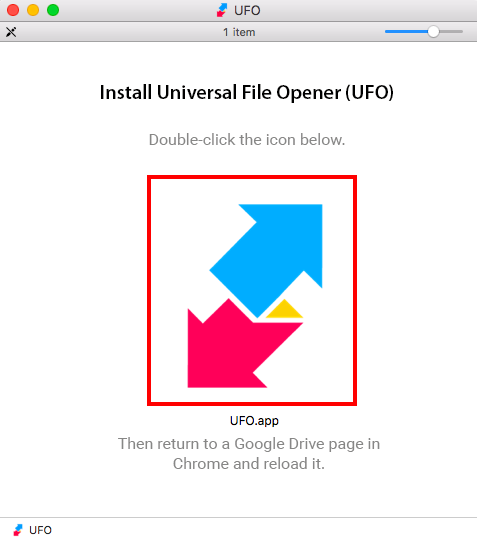 The UFO extension is composed of a Google Chrome extension and a local Sync Client. They both must be installed on your computer (Windows or macOS). 1. 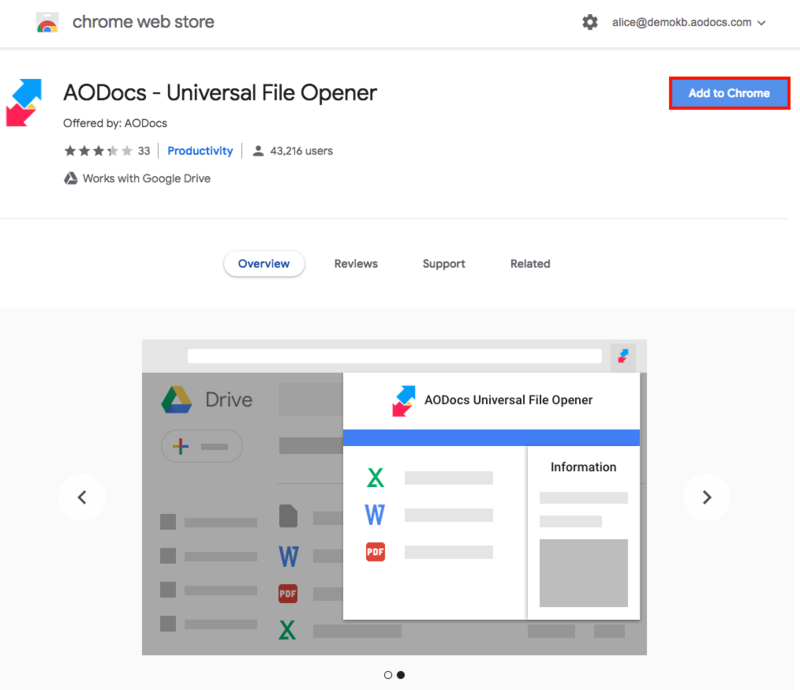 Open the Universal Files Opener - Chrome Extension link. The Google Chrome extension pop-up opens. 2. Press Add to Chrome. 3. A pop-up opens to request confirmation that you want to install UFO. Press Add extension. A pop-up opens to confirm that UFO has been added to Chrome. Press Click here to download the synchronization client in the pop-up displayed when the UFO extension is active on your Google Chrome Profile. Press the download link available in the extension pop-up. It should be installed by an administrator, and installs the UFO client for all users at once. 2. Once downloaded, double-click the .msi file to open it. 3. Press the Execute button. 4. 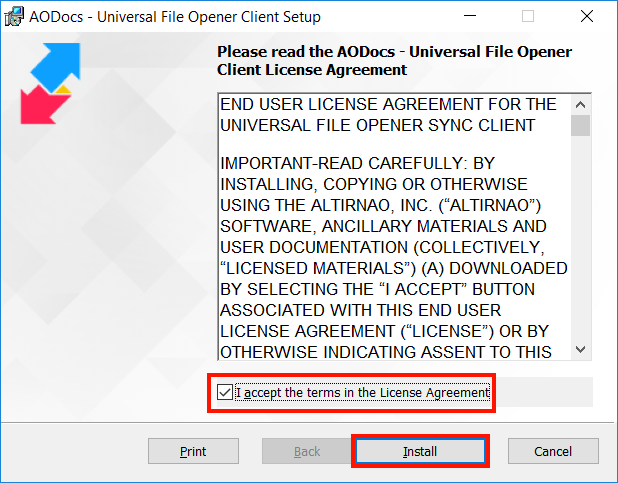 Read the license agreement and select the check-box to accept the agreement, then press the Install button. 5. Press the Finish button. A message confirms that the Sync Client is installed. 6. 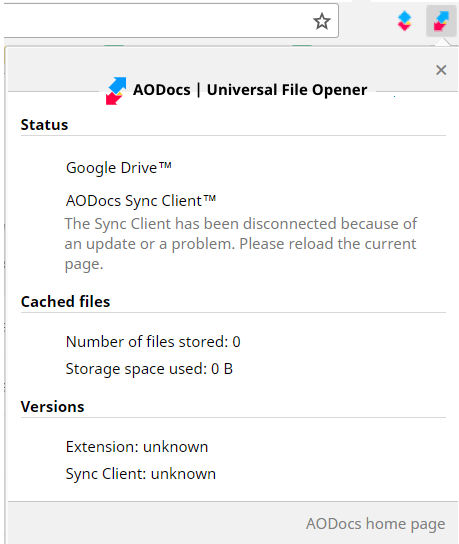 Open Google Drive or AODocs and start opening and editing non-Google files. Press Click here to download the synchronization client in the pop-up displayed when UFO is active on your Google Chrome Profile. Press the link available in the extension pop-up. Use this link: UFO Sync Client - macOS. 2. Once downloaded, double-click the .dmg file to open it. 3. Double-click the UFO button. 4. Press the Open button to finish the installation. 5. 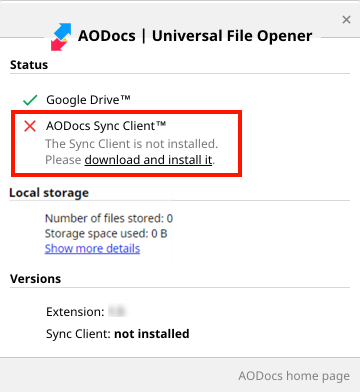 Open Google Drive or AODocs and start opening and editing non-Google files. Important: As a macOS Sierra user, if your security preferences allow only the installation of applications from the App Store, you will get the following error message when opening the Sync Client .dmg file. 1. Press the drop-down arrow of the .dmg file and select the Show in Finder option. 2. Right-click the .dmg file and select the Open with option. 3. 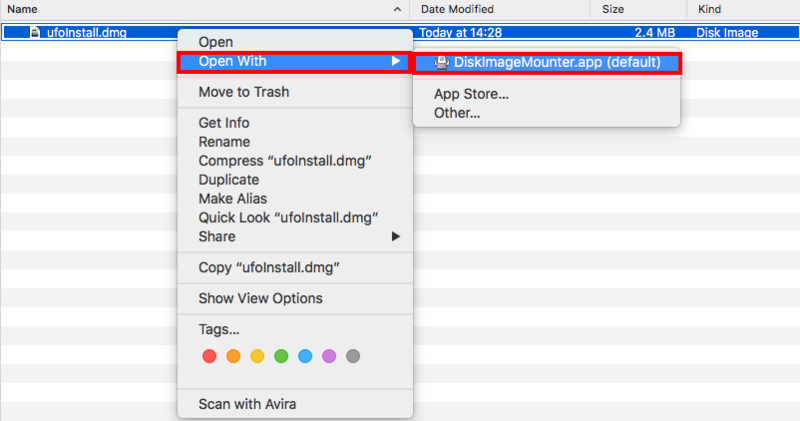 Select the DiskImageMounter (default) option. 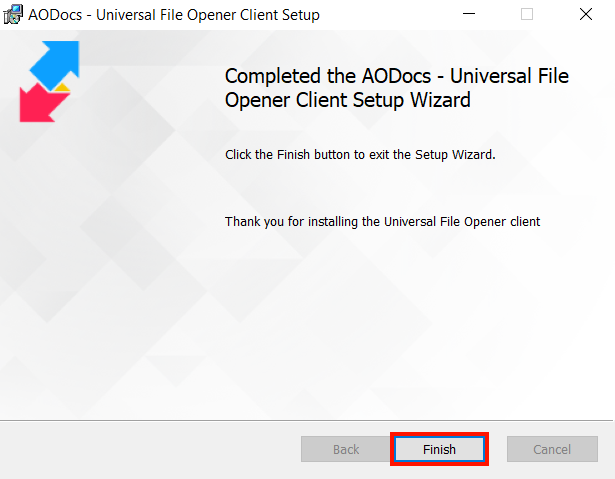 Note: If you already have the Smartbar installed or if you're using UFO with AODocs or Awesome Drive, UFO is automatically authorized after installing it. You won't be prompted to grant authorizations for UFO. If you're using UFO without the Smartbar, AODocs or Awesome Drive, you're prompted to give permissions when you use UFO for the first time. Press Allow to grant permissions to use UFO. If you’re using several Google accounts in the same Chrome session and you don’t want to give permissions to UFO for the current account, press Never for this account. Note: If you subsequently install the Smartbar for this account, UFO will automatically be authorized. You won't see the authorization prompt, but UFO will be active and authorized for this account. If you have both the Smartbar and Awesome Drive installed and active, UFO can't be initialized. This error message appears. It doesn't make sense to have both the Smartbar and Awesome Drive installed. The Smartbar has all the features of Awesome Drive, and more. You are therefore recommended to disable the Awesome Drive extension on the page: chrome://extensions.